Why has this boat not sold ??? Maxprop 3 blade ( Fitted ) 2 & 3 blade fixed. pressure gauges mounted in companionway. Hurth HBW 150-2, 1RV Gear Box. All 2009 sails have had very little use and reported to be in very good condition. Aluminum spinnaker pole. Selden rod-kicker. Selden Furlex 300S genoa furler. Dyform wire with Norseman fittings. Fore and aft lowers, mid and mast-head stays. Forestay with furler. Removable inner fore stay for storm sail. Back stay with Harken adjustable tensioner. Chain plates attach through the deck to knees molded into hull. Main halyard and control lines led aft through Lewmar stoppers for easy shorthanded sailing. Halyards and control lines are Spectra core with Dacron cover for minimum stretch and long life. 110 volt, 3 batteries charged by: engine, wind generator, solar panels, shore power, generator 110 v vessel with step down transformer for 220 v shore power. Generator is 2000 Watt 110 v Honda portable gasoline type. Magnum Energy MS Series pure sine wave Inverter Charger ( 110 volt ). 2 x 90 watt BP Solar panels with Prostar PS-15 regulator by Morning star Corp. KISS Energy Systems wind generator. Aqua Marine 25 gal/hr water maker is engine-driven but will require new membrane. Some 110 v power tools. Solid GRP hull, cored deck, modified fin keel & skeg hung rudder. Forward head converted to dedicated workroom with storage shelves / drawers and a bench with 5” vise, all the cabinetry remains and it could revert to its former use. Aft heads has large separate shower with hot/cold water. A/C is a portable unit. 8 x 12 V fans. 9 cf fridge / freezer with three separate compartments: freezer, fridge, and cool box. Danfoss compressor. Magma propane BBQ with dedicated gas piping and shut off valve in gas locker. GAS BOTTLES 2 x 20 lb. fiberglass. and oven. Dickenson doubles as cabin heater in cool climates. Electric fuel pump fills a 7 gallon day tank to supply the stove. 2 x Lewmar 42 winches at mast base for foresail and spinnaker halyards. 2 x Lewmar 65 sheet winches. 1 x Lewmar 42 cabin top winch for control lines & 1 x Lewmar 46 electric cabin top winch for main halyard and control lines. Primary anchor: 90 m 5/16 G-4 galvanized chain. Stern anchor 30 ft. chain with approx 600 ft ½” three strand nylon rode. Furuno RD-30 display at nav table. This unit collects data from sensors, displays the data, and distributes the data to the chart plotter and autopilot at the helm. Chartplotter bypass switch at navigation table will send data directly to autopilot for energy saving. 1 x Engine-driven crash pump. EPIRB requires battery and life raft servicing. Fire Extinguishers: 1 x Automatic in engine room, 2 x 2 lb, 3 x 5 lb. Fireboy-Xintex S-2A propane/CNG fume detector with solenoid valve control. Sometimes called Perry's Swan, after her designer Robert Perry and the well known Nautor yachts, Nordics are well regarded fast cruising yachts. Commissioned by an Alaskan doctor who sailed her single handed down the west coast of the American continent around Cape Horn and eventually to the Falkland islands, following a rescue by fishermen after braking his ribs in a storm off the coast of Chile. After the Falklands Islands she sailed to the Caribbean where she cruised for 7 years before being shipped to the Seattle area and sold. The second owner spent some time preparing her for an extended cruise but only got as far as Mexico before a rebellious wife caused her to be sold to her current owner of 14 years. The current owner left the US for Mexico in 2004 and then South America, the Pacific, NZ where she was refitted in 2008 then on to Australia, Indonesia and finally Thailand. 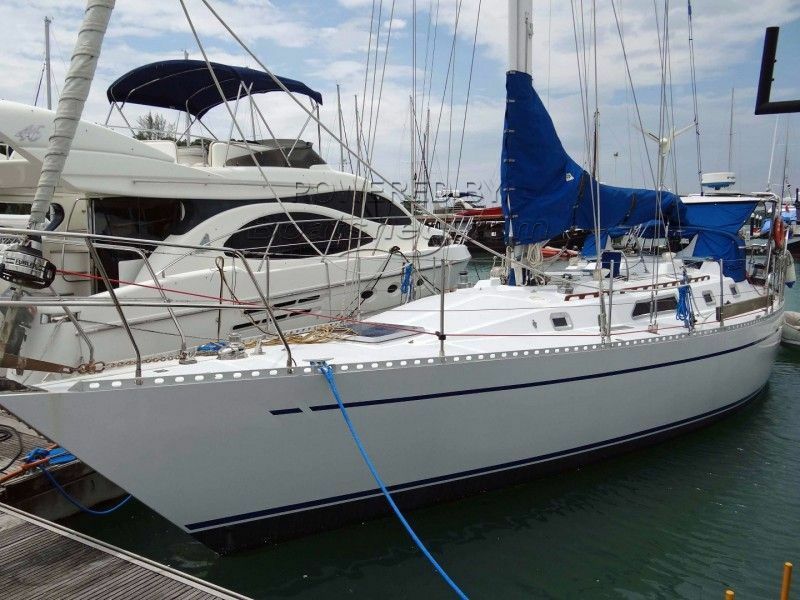 Having been there and done that, it is time for a change and the owner of this very well built blue water cruiser is offering her, somewhat reluctantly, for sale. They just don't build yachts with 1 inch thick floor boards anymore ! This Nordic Yachts 44 Fast Cruiser has been personally photographed and viewed by Alan Giles of Boatshed Phuket. Click here for contact details.